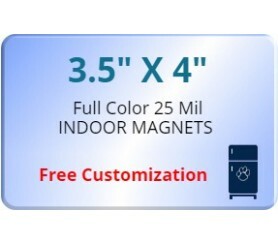 3.5x4 customized magnets 25 mil round corners serves high expecting marketers who wish to be closer to their customers always. This magnet is produced using strong material, which remains unaffected under atmospheric pressures and serves longer than 20MIL magnets. This refrigerator magnet can be imprinted with impressions that also make it one never-tiring piece of fridge art. Marketers can always try to improve its service span by imprinting it with colorful brand symbols and exciting business information. 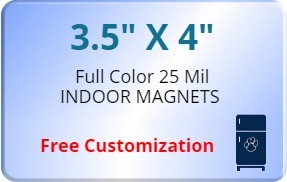 Request a quote to know price savings on bulk orders of custom 3.5 x 4 inch round corner printed 25 MIL full color magnets.